Zipping down a ski hill or across a canopy of trees is a great way to experience Northern Michigan and with three zip lines Up North, a variety of experiences are available. 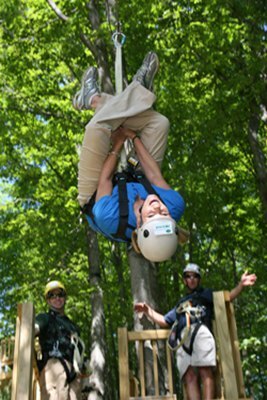 At Boyne Highlands, the Zipline Adventure is a year 'round, all thrills, no skills activity for the entire family. The guided 2.5-3 hour Zipline Adventure Tour features a series of eight lines traveling more than 3,250 feet. Fly at speeds of 20-25 mph on lines up to 50 feet high and over 1,300 feet in length. Starting at the top of the mountain, riders descend more than 50 stories while routed through trees and across the slopes down to the base area. The Twin Zip adds even more excitement with two rides. 800-GO-BOYNE. Boyne Mountain's Zipline Adventure Tour is 2.5-3 hours of pure fun featuring a series of 10 lines (9 in the winter) traveling up to 4,300 feet. The Zip Lines run year 'round. Fly at speeds of 20-25 mph on lines up to 50 feet high and 780 feet in length. These lines are routed through trees and across the slopes at Boyne Mountain. The Twin Zip start near the base of the Meadows Lift, flies a distance of 780 feet over Cliff Dweller Road, fountains, a pond and trees before landing on the final platform 25 feet above the lawn of the Mountain Grand Lodge and Spa. These exciting side-by-side lines provide their own thrills and allow riders to race against friends to add to the experience! 800-GO-BOYNE. Wildwood Rush across from Young State Park outside Boyne City offers a three-hour canopy tour travels across nine lines.